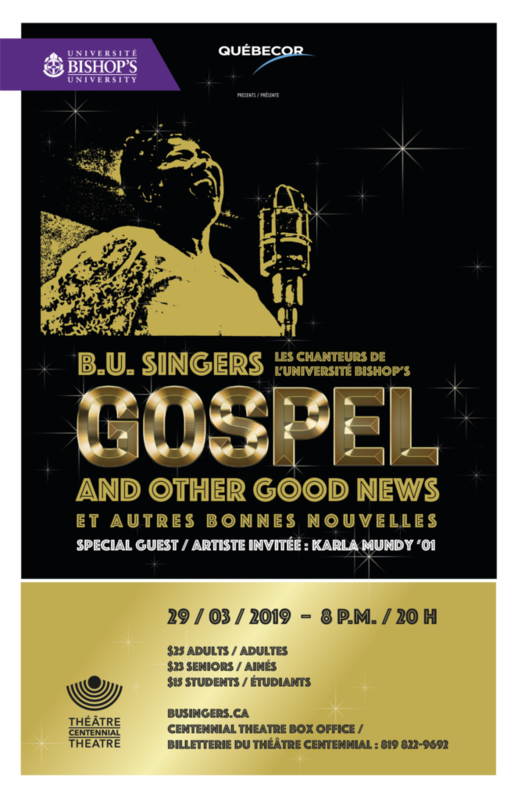 The Bishop’s University Singers’ newest concert, Gospel and Other Good News, will be presented at the Centennial Theatre on Friday, at 8 p.m. on March 29, 2019, and will showcase the performance of BU Singers alumna Karla Mundy (’01) – now a well-established choir director and singer in the Vancouver area, who also offers singing workshops throughout North and Central America. The concert will feature a number of Gospel standards such as How I Got Over, His Eye is on the Sparrow, The Storm is Passing Over, as well as many Gospel-inspired secular pieces including Heaven Help Us All, I’ll Remember You, This is Me, and Light of a Clear Blue Morning. The concert will also see the long-time BU Singers Artistic Director Dr. James Crooks return to the helm while current Artistic Director Fannie Gaudette is on a one-term temporary leave, concentrating on songwriting and taking part in the Ma Première Place des Arts competition among her many projects. This concert is made possible thanks to the support of Bishop’s University, the Department of Music, and Bishop’s University Singers’ main sponsor Quebecor. The generosity of Quebecor sustains the BU Singers’ concert series by allowing the choir to expand collaborations with professional musicians as well as established organizations such as the Orchestre symphonique de Sherbrooke and the Orchestre symphonique de Drummondville. Karla Mundy is a vibrant, soulful and diverse vocalist, pianist, arranger and choir leader. Karla directs the four adult community choirs in Vancouver, Bowen Island and Vancouver Island. She loves leading harmony singing workshops and has taught at GSGW, Voiceworks, Beyond Trad, Sing Smithers, VIMW, SongRoots and at many choir and work retreats. 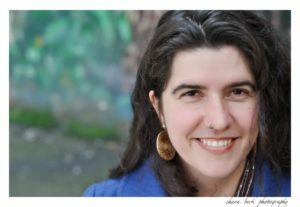 Karla is the founder of SongRoots and is the main organizer of many vocal workshops, retreats, camps and singing/study trips. She is very passionate about providing opportunities for people to sing in harmony and learn about their voices and music in a fun, encouraging and inclusive environment. She has recently led singing study trips to Cuba, Asheville and the Republic of Georgia. As a performer, Karla is a founding member of the No Sh!t Shirleys, TriVo, Cleia, Plough, The Tanglewood Trio and she released her first solo CD called ‘Way Back’ in 2012.